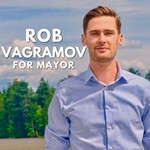 Contribute to Rob Vagramov for Mayor of Port Moody! I am a resident of BC, AND: either a Canadian citizen, or a permanent resident of Canada. Robert Vagramov Campaign requests some further information. Robert Vagramov Campaign is managing the funds for this campaign.